Nothing is better than betting on world heavyweight title bouts. Unified heavyweight champion Anthony Joshua defends his world championships (IBF, WBA, WBO) against mandatory challenger Alexander Povetkin on Saturday, Sept. 22, at Wembley Stadium in London. Joshua vs. Povetkin will be presented live in the U.S. via Eddie Hearn’s new global streaming platform, DAZN, and all eyes will be on the British fighter, Joshua, who will be looking to make a strong statement against Povetkin to secure his status as the top heavyweight in the sport. According to bookmakers, Joshua is a very heavy favorite to defeat Povetkin. William Hill offers Joshua -909 on the outright win market, the most generous moneyline on the board. Povetkin is +550 at the same place, but if you’re looking to back Povetkin to score the huge upset, be sure to shop around with boxing top bookmakers to maximize potential returns. 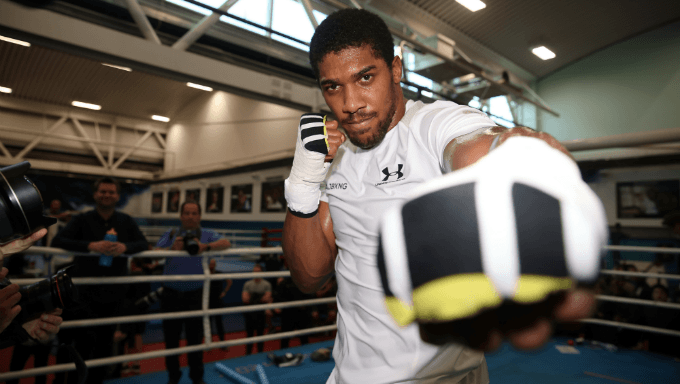 Despite the hyperbole being bandied about by pundits over the potential heavyweight megafight between former heavyweight champion Tyson Fury and current WBC heavyweight champion Deontay Wilder later this year, Joshua remains the preeminent heavyweight in all of boxing. Joshua is younger than both Fury and Wilder, more accomplished and just plain looks like he’s better in the ring when he fights. Still, Joshua’s team doesn’t seem super interested in getting its fighter in the ring with either Fury or Wilder in the immediate future. His promoter has gone nuclear on the opposing sides in the press, especially after negotiations with WIlder’s representatives fell through earlier this year. Perhaps it’s all just posturing, or maybe the sides really just can’t get on the same page. Whatever the case, Joshua’s primary weapon against those who believe he’s ducking Fury and Wilder will be how he looks against Povetkin. Star fighters have a way of fighting in the ring that makes most people forget anything but what happens there, so Joshua’s performance against former title challenger Povetkin will be judged not only on what happens in the fight but how it all goes down. Joshua will be aiming to both defeat Povetkin and look good doing so. Povetkin is 38 and this will probably be the last time he fights for a legitimate heavyweight championship. The Russian fighter was a secondary heavyweight titleholder from 2011 to 2013 but lost his belt when he tried to dethrone Wladimir Klitschko in Moscow in 2013. Klitschko won an unanimous decision over Povetkin, and since the defeat Povetkin has worked hard to put together eight straight wins against solid opposition to earn another opportunity at heavyweight glory. Povetkin has been one of the best heavyweight fighters in the world for the last decade. There was no shame in losing to Klitschko, one of the most accomplished heavyweight champions in recent history. But Povetkin has failed overall to capitalize on his immense talent and pedigree by not securing a legitimate world championship. He knows it. His handlers know it. And against Joshua, he’ll find himself with one last shot at the heavyweight throne. Joshua vs. Povetkin features two of the top heavyweights in the world. Joshua is ranked No. 1 in the division by both The Ring and the Transnational Boxing Rankings Board (TBRB). Povetkin is ranked No. 3 by The Ring and No. 5 by the TBRB. Boxing writers expect a topnotch battle between world class competitors. But people in boxing expect huge things from Joshua, and oddsmakers don’t expect the fight to go the distance . William Hill says it won’t last all 12 rounds at -345 and will let you lay a bet on it going the distance at +250. If you think Joshua will knock Povetkin out, it’s because you see Joshua as more like Lennox Lewis -- not just a heavyweight champ but an elite heavyweight champ with real staying power. The bout against Povetkin will go a long way to telling us if that’s true. Oddsmakers seem to think so, but the level of opposition Joshua has faced hasn’t provided enough true tests yet against world class opposition for people to know for sure. Both Joshua and Povetkin on competent boxers. Joshua has a good jab and is adept at countering with hard punches when his opponents stand in front of him. Povetkin has solid power but lacks the overall speed and power one likes to see in a heavyweight of his stature. His footwork is okay but he’s a little slow and clunky. Joshua should be able to get Povetkin in places he can do real damage enough in the fight to score at least a knockdown if not the knockout. Joshua is very likely to defeat Povetkin. He appears to be an elite star rising to the top of the sport. While Povetkin is a good heavyweight, he just plain isn’t elite. He’s good enough to beat other contenders but he’ll be in deep waters against a talent like Joshua much in the same way he was when he fought Klitschko. But Povetkin was a younger, better fighter back then. So even if Joshua doesn’t turn out to be that much better than Klitschko was at his peak as champion, Povetkin’s probably in for a really tough night. I like backing Joshua to win at -909 at William Hill as the most certain bet on the board. I’m not sure Povetkin can go the distance, but I’m equally unsure how Povetkin might react to being down on the cards late in the fight. He didn’t press for the knockout against Klitschko five years ago but all these years later he might seem more inclined to push himself for the win. If he does that, Joshua has the power and form to knock Povetkin out. You can grab Joshua by KO, TKO or DQ with William Hill at -278 and the same thing at Ladbrokes. If you’d rather pinpoint the round groups for greater returns, I like Joshua in rounds 7-9 at +350 from William Hill.